As the national campaign against blacklisting in the construction industry grows, George Tapp, Unite memberÂ and veteran anti-blacklist campaigner, was hospitalized after being deliberately knocked down by a car as he took part in a protest against blacklisting at Manchester City football ground last week. 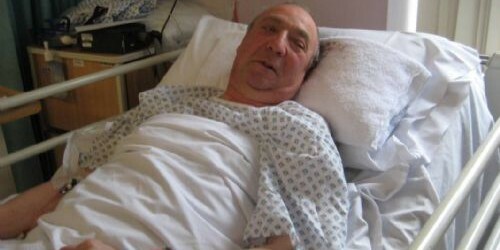 George, 64, was taken to the MRI Hospital last night with two broken legs and a fractured knee-cap. The incident took Â place during a peaceful, lawful picket of BAM construction, one of the companies identified in blacklisting workers for trade union activity.Â Witnesses say the car drove deliberately and at speed into a crowd of protesters who were leafletting at the BAM construction site. BAM paid Â£38,371.85 to the Consulting Agency, a firm that ran anti-union blacklists, between 1996 and 2009. Shadow Business Secretary Chuka Umunna recently called for a Leveson-style inquiry into the blacklisting â€“ an illegal process which prevents workers deemed troublesome or involved in trade unions from finding work. For some background on the struggle against blacklisting in London at see our previous post about electrician Frank Morris, who is spearheading the campaign in the capital. Messages of support can be sent to George via 07949 335 390.